Penang Straits Chinese cuisine is heavily influenced by Thai cuisine owing much to its geographical proximity. About 500 years ago, Penang was part of the Kedah Sultanate which was ruled by the Siamese overlords. So the exertion of cultural and hence culinary imperialism stemmed back long and far. The earliest Peranakans in Penang were said to have been from Phuket, further ascertaining and strengthening the inseparable links between Penang Peranakan cuisine and Thai cuisine. This is very apparent in Penang Otak Otak, which bear uncanny resemblance to the Thai Hor Mok Pla. But the one culinary discipline in Penang Peranakan cuisine which is truly exemplary of Thai influence is the art of “Kerabu” making. 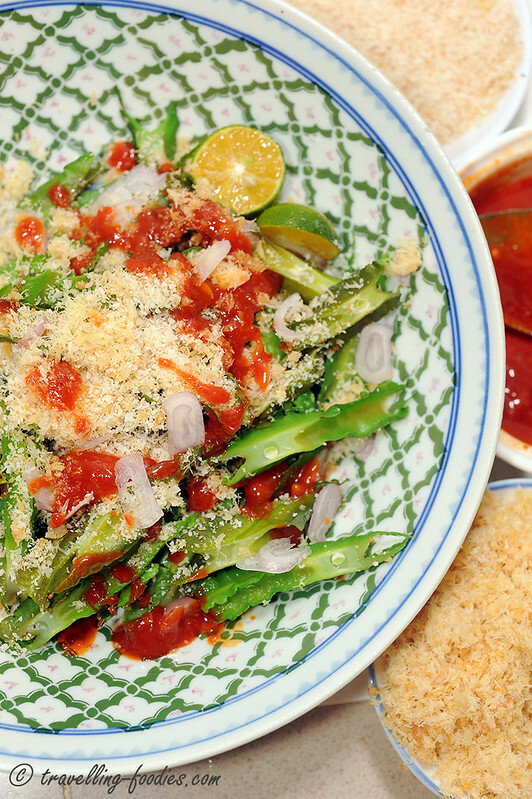 “Kerabu” is a form of salad in Malay cuisine where “vegetative” components in the form of leaves, fruit, beans, roots and even shoots are used usually raw or quickly blanched, and tossed with a concocted spicy sauce. Sometimes, meat elements are also added as well. The most famous of all Thai salads is of course Ya mamuwng, better known as the “Thai Green Mango Spicy Salad” where chili padi (bird’s eye chili), green lime and thai fish sauce are used like in many Thai salads, as the seasoning base. This is mirrored in Penang Peranakan cuisine which replaced it with sambal belacan, limau katsuri (calamansi lime) juice instead. 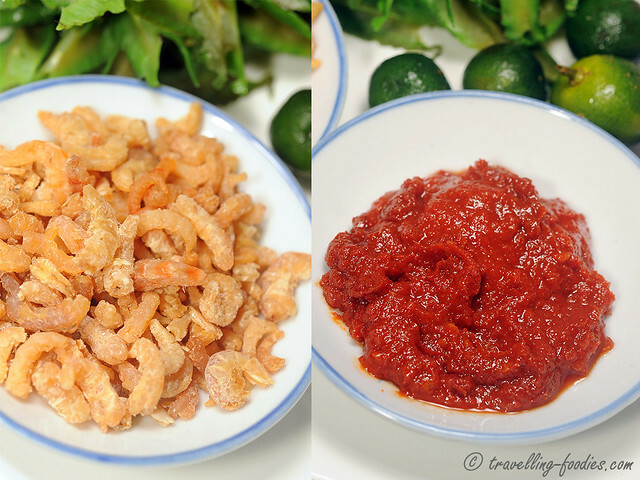 While crushed peanuts is commonly used as a topping in Thai salads, bunga kantan (torch ginger blossom), daun limau purut (kaffir lime leaves), kerisik (toasted grated coconut) and/or serunding (meat floss) are adopted in Penang Peranakan kerabus instead. This makes Thai salads similar, yet vastly different from Penang Kerabus. A wide range of ingredients can be used for the Kerabus, which can be divided into two main groups, i.e. those with “vegetable” elements as the main ingredients, and those with “meat” elements as the predominant ingredient. 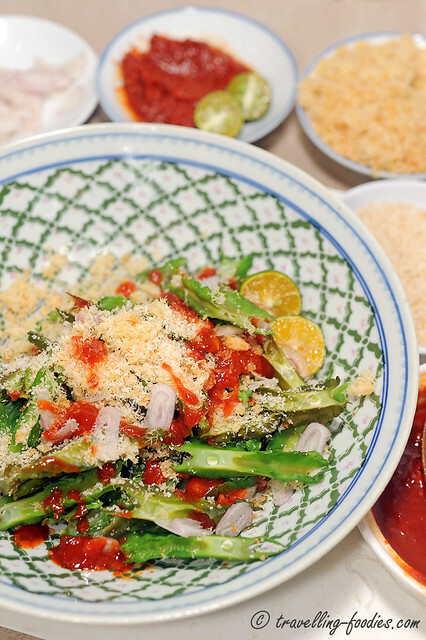 The former would include Kerabu Bok Kway (green papaya), Kerabu Ong Lai (pineapple), Kerabu Timun (cucumber), Kerabu Taugeh (beansprous), Kerabu Pucuk Paku (fiddlehead fern shoot), while others like Kerabu Kay (chicken), Kerabu Bak Phoey (pork skin) Kerabu Kay Kah (deboned chicken feet), Kerabu Hai Thay (jellyfish), Kerabu Bak Eu Phok (deep fried lard croutons). Kerabu Kerang (cockles), would fall into the latter group. Some like Kerabu Jantung Pisang (banana blossom + prawns), Kerabu Bok Ngee (black cloud fungus + chicken) and the more exotic Kerabu Babat (veal tripe + longbeans) are seemingly a marriage of the two categories. My personal favorite has to be Kerabu Kacang Botol. 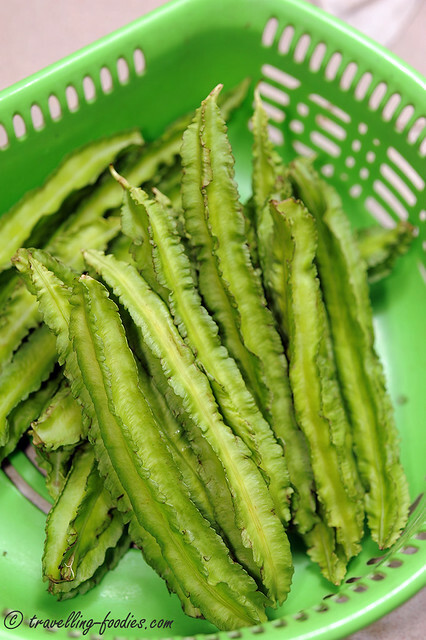 Kacang botol, or winged bean/angled bean is a creeper which is grown along the fence commonly with bunga telang, the blue pea flower whose vibrant colour is much coveted and used in many Peranakan kuehs. I love it for its crunch and most importantly, the almost fuss-free nature of this dish, allowing me to whip it up very quickly using very little time with readily available ingredients. 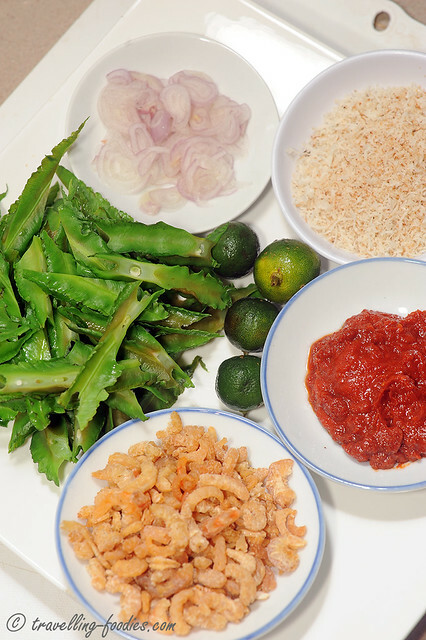 As with most, if not all Penang Peranakan kerabus, kerisik, sambal belacan and calamansi lime juice are the practically indispensible ingredients and Kerabu Kacang Botol is no different. Kerisik can be made in a large batch and frozen, to be used as and when required. This is similarly done with sambal belacan, which makes it very easy to prepare Kerabu Kacang Botol for a side dish for dinner. Sometimes, I would “bastardise” it slightly by added bee hoon （rice vermicelli) or tang hoon (green bean vermicelli) to make a complete meal. Not quite the proper Kerabu Bee Hoon or Kerabu Tang Hoon in “full scale” as many ingredients are missing, but definitely good enough for a quick lunch. Rinse winged beans and nib off the ends. Blanch winged beans in boiling water for about half a minute and immediately plunge into a bowl of cold water to halt the cooking. 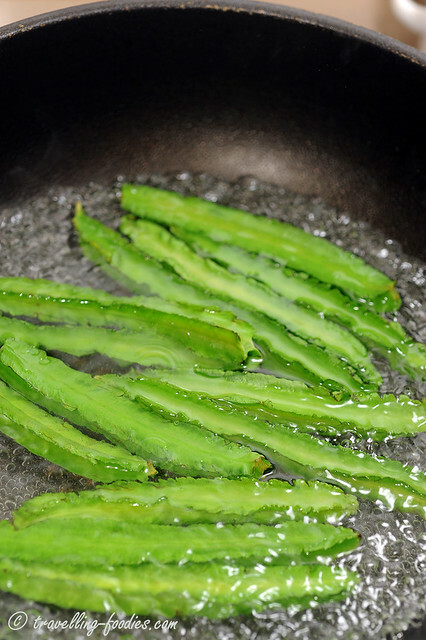 Slice winged beans diagonally to 1-cm thickness. To prepare dressing, squeeze calamansi limes into a small bowl. To the lime juice, add sambal belacan, sugar and salt. Stir to dissolve the sugar and salt. 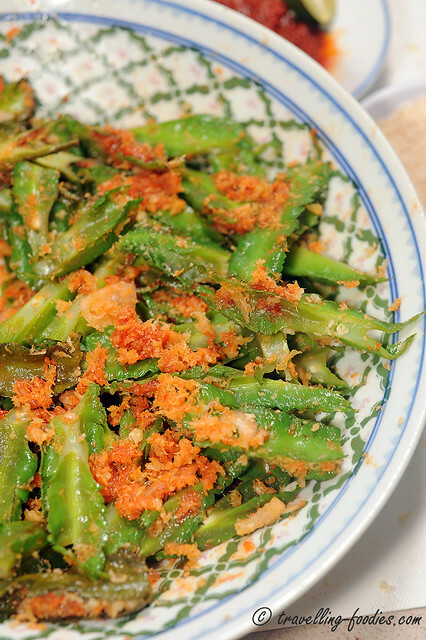 Place sliced winged beans onto a plate. 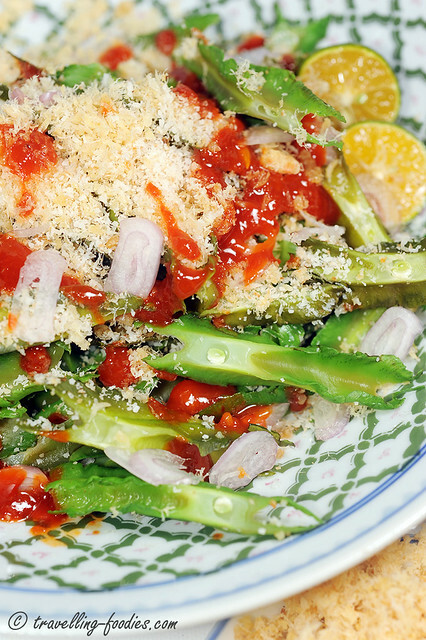 Drizzle sambal belacan dressing over the beans and garnish with kerisik, pounded dried shrimp and sliced shallots. Serve immediately and toss everything evenly before eating. Heat wok and dry fry fresh grated coconut over a medium-low fire until it turns light brown. It should take between 10-15 min. Do not pour too much kerisik into the wok at one time as the cooking would be uneven. Toss all the time to prevent the grated coconut at the bottom from browning too much and charring. Do not attempt to use a stronger flame to save time as that would increase the tendency of the kerisik burning. 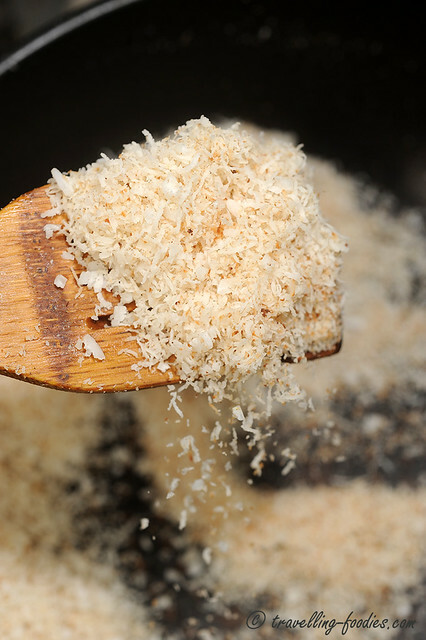 Towards the end of the process, the grated coconut should become dry, grainy, much lighter and could be “swirl” around the wok with ease. The aroma of toasted coconut would also be very very apparent. Pound or blend the kerisik first before use. A large batch can be made with the rest stored either chilled or frozen. Pound or blend 100g of fresh red chilies together with 2 tsp of toasted belacan and combine with calamansi lime juice. Depending on the level of heat preferred, the red chilies can be partially replaced with cili padi. On the other hand, if the diners are less tolerant, the level of heat can be controlled by deseeding the chilies before use. For kacang botol, always buy them fresh and use within a day or maximally two. They do not keep well. For choosing kacang botol, I usually buy the muda “younger” and thus shorter ones as they are softer. The bigger ones, despite being more crunchy can be rather fibrous which some may deem as lesser desirable. This entry was posted on June 6, 2013 by Alan (travellingfoodies). It was filed under Food, Simple Eats and was tagged with dried shrimp shallots, four angle bean, kacang botol, Kerabu Kacang Botol, kerisik, Penang, sambal belacan, toasted grated coconut, winged bean. Love the food and the effort put into the styling ! That blue and green plate is really a nice retro piece that my mum had too.